A few “Sunday Funday” final moments with the mural at my Alma Mater! 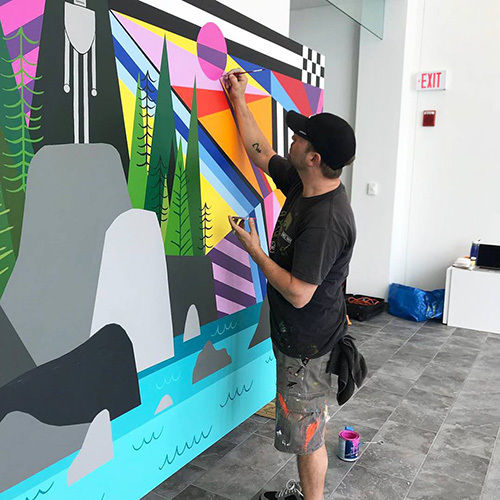 A few final strokes on the collaborative “LIVE” mural at the Virginia Children’s Book Festival on the campus of Longwood University . Good times drawing and painting the imagery from Peter Brown Studio‘s “The Wild Robot” with my “Fractal series” visuals filling the sky. Peter’s titles include New York Times bestsellers like The Curious Garden and Mr. Tiger Goes Wild. The VCBF brings together authors and illustrators with exciting, dynamic programs to foster the enjoyment of reading among Virginia’s youth. Completed mural images coming up!